Eastern cottontails race for their lives from day one. A slight movement, a quiver and a flash of white tail — catching the mad dash of an eastern cottontail rabbit in our pasture was one of my favorite sights when waking up early for school in North Central Texas. Even today, I still feel a thrill when I see the dark eyes and stock-still body of a cottontail watching me from out of the brush. Eastern cottontail rabbits are one of the most common species of rabbit in North America. In Texas, they inhabit all but the western arm of the state, which has its own distinct species of cottontail: the desert cottontail. An adult cottontail weighs 2-3 pounds — about the same as a large pineapple. Their fur is brownish gray, with rusty brown around the neck and shoulders and white on their underbellies and the puffy tails for which they were named. Cottontails are born blind and hairless in plush, fur-lined nests. These cozy homes are usually just depressions in the ground, located in tall grass or brushy areas. Success for a young eastern cottontail is often as simple as just surviving to reproductive age. Rabbits have an 85 percent annual mortality rate — in other words, only 15 percent of all baby rabbits live to become adults. Cottontails are a perfect snack for predators such as coyotes, snakes, hawks, opossums, cats and weasels. 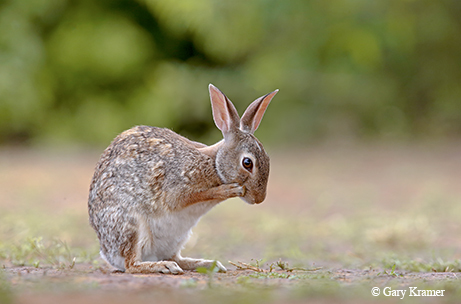 Protecting themselves from predators is not the cottontails’ strong suit; they usually rely either on camouflage or on their speed and erratic zig-zag running patterns to evade hungry carnivores. What they lack in defense mechanisms, they make up for with sheer numbers. If you’ve ever heard the phrase “breed like rabbits,” this is why: Each cottontail rabbit generally has four to five litters per year, with four to eight babies per litter. That can add up to 40 baby rabbits per year! With their plush fur coats, it’s hard to imagine how eastern cottontails can survive a Texas summer. The little rabbits have a few tricks up their sleeves; the secret to their temperature regulation lies in their long, translucent ears. Because the rabbits sweat very little (having fur makes sweat an impractical cooling mechanism), they use their ears as radiators. When the rabbits get hot, the blood vessels in their ears dilate, and they pump warm blood into them so some of the heat can be released into the air. Cottontails’ courtship ritual is called “cavorting.” Males and females race around, hop energetically and even fight prior to mating.